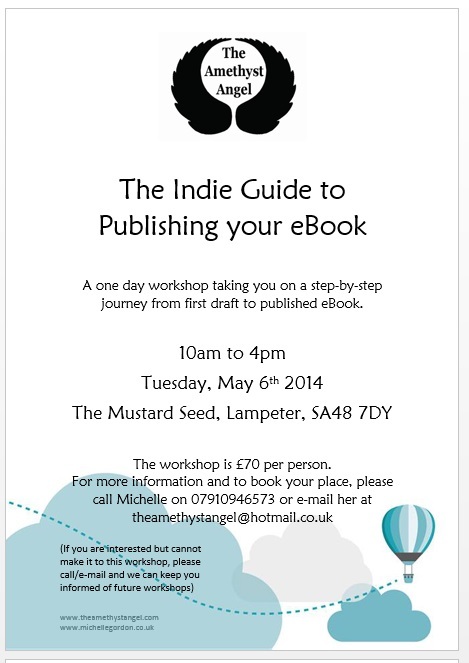 I will be holding a workshop in Lampeter, West Wales, on the 6th May, in which over the course of a day, I will take the participants through the process of publishing an eBook. It’s going to be a mad, jam-packed day, as there is quite a lot to cover! For the course fee, each aspiring author will receive the day’s tuition, a comprehensive manual, and follow-up e-mail support. There are only 8 places left, so if you live in West Wales and would like to learn how to publish your own eBook, get in touch. You can e-mail me at theamethystangel@hotmail.co.uk or call me on 07910946573. I will be holding more of these workshops in other areas of Wales and England, so if you are interested in attending one, please get in touch and let me know where you are.